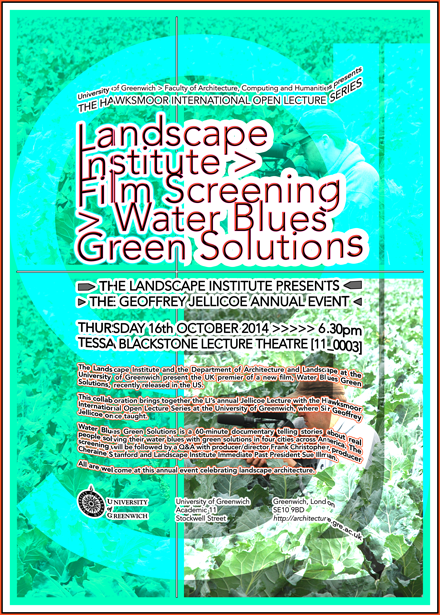 The Landscape Institute (LI) and the Department of Architecture and Landscape at the University of Greenwich present the UK premier of a new film, Water Blues Green Solutions, recently released in the US. On Thursday the University hosts the LI’s Council Meeting, AGM and evening Jellicoe Lecture. This collaboration brings together the LI’s annual Jellicoe Lecture with the Hawksmoor International Lectures at the University of Greenwich where Sir Geoffrey Jellicoe once taught. Water Blues Green Solutions is a 60-minute documentary telling stories about real people solving their water blues with green solutions in four cities across America. The screening will be followed by a Q&A with producer/director Frank Christopher, producer Cheraine Stanford and Landscape Institute Immediate Past President Sue Illman. All are welcome at this annual event celebrating landscape architecture.